After several pre-season friendlies over the last few weeks, the serious stuff will begin for Bexhill United Football Club this coming Saturday. The Pirates will get their competitive fixtures underway with a trip to Macron Store Southern Combination League Division One rivals Southwick in round one of the Peter Bentley Challenge Cup. Ryan Light will take sole charge this term having been joint manager with Nigel Kane last season. Kane has stepped down due to changing work commitments; he is now spending a lot of time in the north of the country. Left-back Craig Ottley is now assistant manager. For the second successive year, Bexhill will begin with a league cup game and if last season’s final table is anything to go by, it could well by a tight one. Bexhill finished one place and two points above Southwick in 2016/17. “(Starting the season) with a cup game) takes the pressure off a bit,” continued Light, who will be without the unavailable Gordon Cuddington. “It’s almost like an extended friendly. You want to win every game and every cup you’re in, but the league always starts off as your priority. From last season’s squad, Bexhill have lost only forward Jacob Shelton, who has joined Hailsham Town. 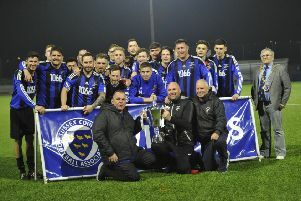 In have come former Hastings United midfielder Tim Olorunda, ex-Westfield defender Lewis McGuigan - who Light says has really impressed in pre-season - former Hastings youngster Ryan Harffey and the experienced Chris Rea. John Akoto, who featured very briefly for Bexhill last term and made a number of first team appearances for Hastings, had signed but has subsequently joined Eastbourne Town. “I don’t think I’ve ever been at a club where everyone wants to sign again (for the following season),” said Light. “It’s testament to the happy camp we had. Bexhill wrapped up their friendlies with games against Sidley United on Saturday and Rotherfield on Tuesday. The match against Macron East Sussex Football League Premier Division side Sidley, which was played in dreadful wet conditions, ended in a 2-2 draw and Bexhill then lost 1-0 to Rotherfield. Bexhill conceded two goals early on against a fired-up Sidley side containing several former Bexhill players. Bexhill carved out several chances during the remainder of the first half, but found Sidley’s goalkeeper in superb form. Bexhill performed very well and looked sharp as they pinned Sidley back during the second period. Cuddington pulled one back and Ottley equalised from the penalty spot. Bexhill didn’t reach the same levels in a very physical encounter against Rotherfield and played the last 25 minutes with 10 men after a couple of players hobbled off, including Craig McFarlane, who had blood on his shirt, shorts and socks! On what Light described as the best pitch he’s seen in non-league football, Bexhill conceded a soft goal early on and didn’t really look like equalising. Their best opening saw Corey Wheeler denied in a one-on-one situation.